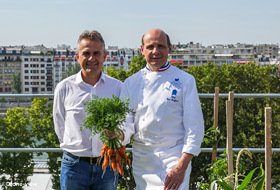 “Le Cordon Bleu” is the name of the renowned international cookery school that opened its new headquarters in Paris in June 2016 and that has a particularly valuable treasurer: a 1011 m² roof garden that allows for the cultivation of an abundance of native and exotic fruit, vegetables and herbs. The garden supplies the kitchen with tasty ingredients and at the same time is part of the educational programme at “Le Cordon Bleu”. 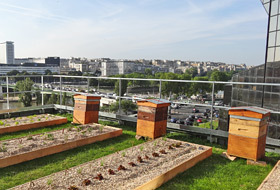 In addition, the roof is home to four bee hives and an insect hotel. 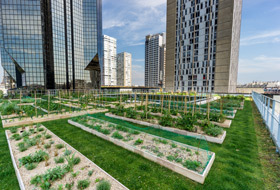 A wonderful example of urban farming, i. e. farming in an urban setting, because rooftops with the right ZinCo green roof are ideal for use as a cultivation area. The long-established “Le Cordon Bleu” cookery school was set up in 1895 and today has an international network of 35 schools in 25 countries. More than 20,000 students are trained to the highest level each year in the subject area of cooking and hotel management. After 28 years in the rue Léon Delhomme, the Paris “Le Cordon Bleu” school has set up on a new campus in the 15th district, adjacent to the Beaugrenelle shopping mall near the Eiffel Tower. With its view of the Seine and the Statue of Liberty, the spectacular, four-storey building is visited each year by more than 1,000 students from over 100 countries. The building made of glass and aluminium was designed by Architect Didier Primard and incorporates the latest environmental standards. The core element is the use of the roof for growing and harvesting crop plants and as an educational and recreational area for people. 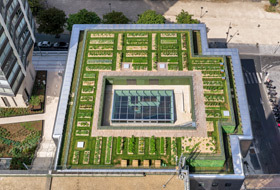 The green roof was installed in May/June 2016 by Ecovegetal, our experienced ZinCo partner in Broué, France. ZinCo provides exactly the right technology with its special “Urban Farming” system build-up for the permanent establishment of the required crop plants on a roof location. Contractors, Ecovegetal, started the green roof works on the 0°-pitch concrete roof that already had a root-resistant roof waterproof membrane. The first layer in the “Roof Garden” system build-up is the mechanically highly robust and resistant Protection Mat ISM 50, which was installed in 2-metre sheets across the entire area. It provides a particularly high retention level at 4 l/m² compared with other protection mats. 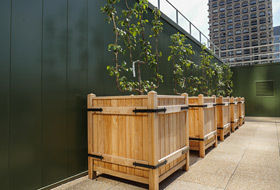 52 planting beds were created in parallel rows over a total roof area of 1011 m². The rectangular edgings made of corrosion-free metal that were later cladded with wooden floorboards are about 25 to 35 cm high, about 5 metres long and 1 metre wide and are therefore easy to access when working on them. A linear network of pathways automatically emerges from geometric arrangement. 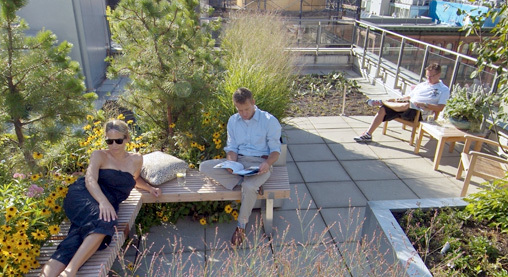 The areas used for different purposes also require different drainage and water retention elements in the rest of the green roof build-up. The successful cultivation of crop plants depends on a continuous and needs-based supply of water, independent of natural precipitation and occurring drought periods. The drainage and water retention element Aquatec® AT 45 provides the perfect foundation for efficient and cost-effective irrigation. The basic principle is based on the distribution and storage of water in the cells of the Aquatec® elements, which alone provides for about 17 l/m². In the event that there is no precipitation, dripperlines feed the water storage elements. These dripperlines are clipped into the elements and connected to an automatic regulation system. The decisive element here is Wicking Mat DV 40 that is placed over the Aquatec® elements and which has capillary-effective fibres that draw the water upwards, making it available to the substrate directly in the root area. Therefore, 50 % of the water supply is sufficient compared with conventional irrigation from above using lawn sprinklers, where water evaporates unnecessarily at the surface. And, unlike other more conventional dripperline irrigation systems, considerably fewer dripperlines are required as the water is distributed across the entire area of the Aquatec® elements. This system of capillary irrigation conserves water to a considerable extent and Pierre Georgel, boss at Egovegetal, is convinced: “This system is the future in matters of irrigation”. The structural requirements of the building allow for an additional overall green roof weight in a saturated condition of maximum 250 kg/m². 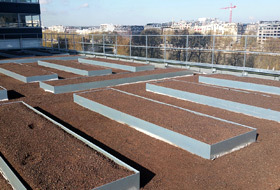 Egovegetal, therefore, developed a special substrate specifically for this urban farming roof that is of a particularly light weight and high quality. 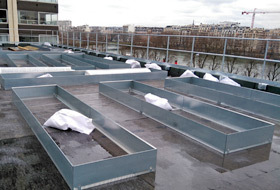 A total of 101 m³ of substrate was blown onto the roof using the company’s own silo tanker and was distributed across the Wicking Mat or across the Filter Sheet PV which separates the drainage layer between the planting beds from the substrate layer. The substrate depth is about 23 cm in the planting beds. The areas around the planting beds were about 8 cm in depth and they are all used as pathways. 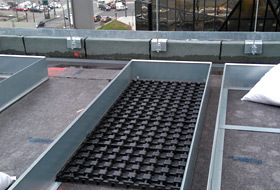 The drainage and water storage element Floradrain® FD 40-E was fitted onto the Protection Mat ISM 50 in the ZinCo “Roof Garden” system build-up in addition to the Filter Sheet PV and the 8 cm of substrate mentioned above. This was followed by the pre-cultivated lawn grid elements, EcoLawn, which contain an additional approx. 5 cm of substrate for the vegetation. In this way, the 597 m² of pathway were greened in no time and are now perfectly equipped for permanent pedestrian use. With regard to wind exposure and solar radiation, the height of the building with its four storeys and the location in this neighbourhood of Beaugrenelle where it is surrounded by towering buildings that are even higher have to be taken into account. This exposure results in aerodynamics comparable with the Venturi effect. This had to be considered when choosing the plants to be used for the location. In addition, the surrounding towers with their glazed façades influence the intensity of solar radiation. Reflection is capable of creating a magnifying glass effect with the result that the vegetation can burn in different spots. For this reason, a model of the path of the sun was examined in advance using a special device called a heliodon, and based on this the sunniest locations during the course of a day were determined. 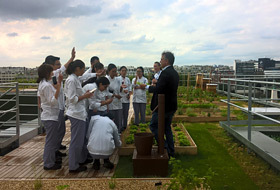 The variety of plants on the urban farming roof is enormous and the students learn about the advantages and special characteristics of each plant at first hand. A total of 1534 herb and spice plants and 1026 fruit and vegetable plants were planted in the planting beds. Apples and pears grow in larger troughs as trellised fruit. Exotic plants such as lemon grass and Eryngium and edible flowers grow alongside traditional types of plants. The honey plants attract pollinators because the roof is home to four bee hives and an insect hotel. 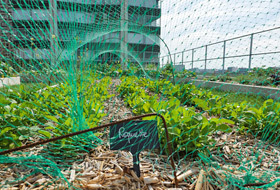 Protective nets are used to keep unwanted guests such as doves away from their favourite foods, the crucifers such as radish, cabbage, carrots and rocket. Compostable waste from the garden and the kitchen is gathered on site, similar to rainwater. A garden hose is connected to the cistern so that the harvested produce can be washed directly on the roof. There is also a greenhouse. Given that the cookery school itself attracts seedlings and in so doing values the use of old types, it specifically ensures genetic heritage and a wide biodiversity. 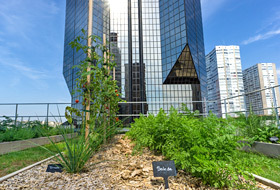 “Le Cordon Bleu” cookery school has created a very valuable educational space with its urban farming roof, which demonstrates to the students close up how fruit, vegetables and herbs can be grown and tended in an urban setting. 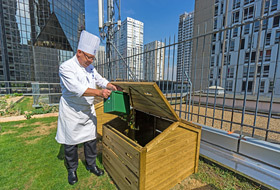 The produce that is regularly harvested fresh from the roof is sufficient both for the various courses in the cookery school and for the in-house café. It is a wonderful example, firstly, of how students of the future can be sensitized to urban farming and, secondly, of the green roof technology that can ensure the permanent cultivation of crop plants on rooftops.